Jim green footwear was born out of humble beginnings in a garage in New Hanover in 1992, with the idea in mind of making a boot that lasts and lasts, with only a few styles handcrafted to start, Jim Green soon started to gain a reputation amongst the local community and live up to its name of being tough, rugged, and being able to go the distance. It wasn’t long before Jim Green boots started to find their way into cities countrywide and soon Jim Green grew into a healthy product range, producing 20 pairs a day. 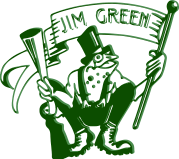 The name Jim Green comes from a sneaky little frog that hangs near the river’s edge, this frog being used by a questionable fisherman at local fly fishing competitions, to illegally hook the winning catch. With the popularity of Jim Green growing it soon found itself a new home on the Midlands Meander. Due to increase in demand, manufacturing of the boots was handed on to Crouch Footwear in Pietermaritzburg, where, with many years of shoemaking experience, perfected the art of making a pair of Jim Green boots and immediately introduced safety and specialist footwear to the range. It was there that Jim Green got a strong footing in the marketplace and became a legend in its own right, for their durability, comfort and quality. Crouch Footwear eventually acquired Jim Green in 2008. Today Jim Green is still South Africa’s number one locally made safety and hiking boots, being worn by our countries major telecommunications groups and large corporations, also remaining a local favourite amongst our farmers.